The simple bookmarking application Instapaper made by Tumblr developer Marco Arment is one of my favorite applications, period. Between the web, the iPhone, and the Kindle, it’s easily one of my most-used apps. And I have no doubt that a fourth category is about to be added to that list: the iPad. 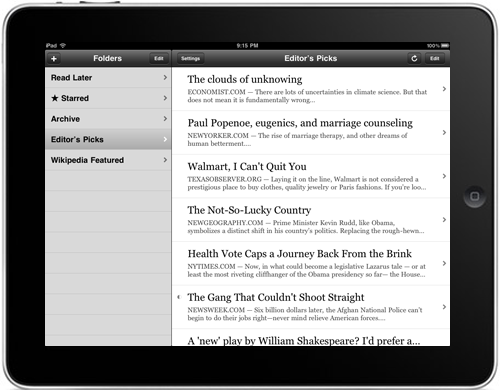 Tonight, Arment posted a preview of Instapaper for the iPad, and it sounds perfect for the device. Aesthetically, it doesn’t appear to look all that different from Instapaper for the iPhone. But as Arment explains, he went through quite a bit of trouble to tailor it for the new device. One entirely new feature is a list screen that allows you to easily navigate bookmarked articles when the iPad is held horizontally. So why not just let users scale up the current iPhone version of the app? Because it looks awful, according to Arment. In fact, he says that the experience of seeing his app scaled this way (2x) has turned him off of the idea of using any app scaled up to the iPad’s resolution. Arment is basing this off of his experience with the iPad software simulator (since no developers have the actual device yet), but I can confirm that some apps did look a bit wonky when scaled up when I played with the device after Apple’s unveiling in January. To be iPad-ready, Arment reworked the latest version of Instapaper (2.2) and now has made a “universal” version of the app. While clearly the iPhone and iPad versions will be different, apparently developers will be able to bundle iPhone/iPod touch versions with iPad versions in one package (the SDK page hints at this). This is interesting as it allows developers to charge one fee for the two different versions. I wonder if more developers will offer similar deals. If Arment was so unhappy with the iPad scaling, clearly others will be as well, and will also be anxious to have an iPad-native version of their app. But telling paying customers they have to pay twice is a bit of a stretch, so this universal approach seems smart. And it conjures up memories of the universal apps that existed as Apple transitioned from its old PowerPC chips to the newer Intel ones. With iBooks and all the print media deals, clearly Apple believes one of the iPad’s core strengths will be reading. 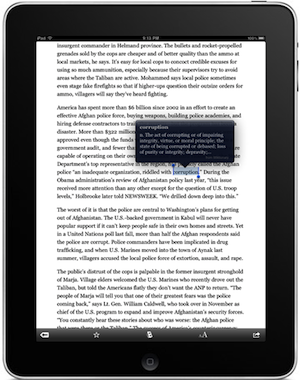 That’s why I think Instapaper may be one of the first real killer apps for the device. Instapaper takes any piece of content on the web and strips it down to its bare reading essentials. It’s a breeze to find a piece of longer content on the web, hit the Instapaper bookmarklet, and revist the content in its stripped-down form later on the iPhone or Kindle. And on the iPad, with this reworked app, the experience looks to be even better.